Our mission is to provide our customers with a competitive, dependable, and quality supply of gasoline and diesel fuel and to service our customers in a fair, honest, and friendly manner. The Schrimpf family are the owners of HWRT Oil Company, LLC. 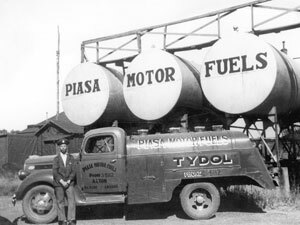 Emil W. Schrimpf started in the petroleum business in 1932 with one 250 gallon tank truck and one service station under the name Piasa Motor Fuels. Upon his death in 1941, his son Bob assumed operation of the business while still in high school. From 1946 through the mid 1970’s, Bob put Piasa on an aggressive growth program adding 25 retail service stations, a transportation division, an asphalt division, and lubricants division. Bill, Bob’s son, joined Piasa in 1969 after graduating from the University of Tulsa with a degree in Petroleum Marketing. In 1976, the aggressive growth continued as the current Hartford Wood River Terminal was purchased from Arco Pipeline. The Facility had a 250,000 operating capacity at the time. Immediately, changes were made to the terminal. Hartford Wood River Terminal built four new 80,000 barrel tanks, which more than doubled the storage capacity of the terminal. A computer controlled loading system was integrated at the loading rack as well as the addition of an in-line ethanol blending system. On May 1, 2004 HWRT Oil Company, LLC (HWRT) was formed. This new company purchased three terminals on the TEPPCO system from Crown/LaGloria, which expanded HWRT's marketing presence in the Midwest. Today, we offer refined petroleum supply at 18 different terminals on three different pipeline systems located in the Central U.S.
Website designed by BrickStreet Creative and maintained by Bundy & Associates.